When I was a young lad – and this is somewhat dating myself – one of the first comics I owned was this fine issue of DC Comics Presents, which features two guys, who both like to wear their underwear on the outside, beating each other up in France. It is entirely possible that this sort of thing happens in France on a regular basis. I’ve never been, so I can only extrapolate from what I’ve seen in movies and television, all of which seem to take place in about a half-mile radius of the Eiffel Tower. There is presumably more to France than that, and flying men in spandex are presumably a rare sight, but I can’t be SURE. Hawkman: Can fly, is pretty strong, likes ancient weaponry and presumably has access to all kinds of advanced Thanagarian technology that he doesn’t use on Earth for some reason that is probably really good but I forget. Weaknesses include, well, he’s just a guy with wings so weaknesses include bullets. Superman: Can fly, is REALLY strong, invulnerable, doesn’t need to breathe, can travel in time, has access to all kinds of advanced Kryptonian technology and, oh yes, HEAT VISION. Weaknesses are, well, Kryptonite and magic. 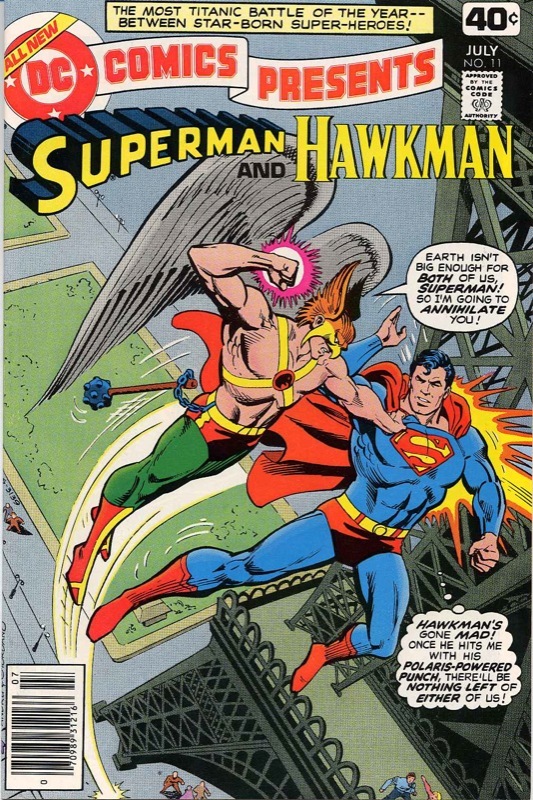 This particular comic was from a period of DC history where Kryptonite was about the third most common element on the planet solely because they didn’t have anything else they could threaten Superman with, but Hawkman does not, in fact, have any Kryptonite with him at the moment. Let’s be blunt here – any actual fight between these two would have Superman momentarily paralyzed simply from having TOO MANY ways to beat the stuffing out of his JLA buddy here. Instead, he figures out that Hawkman is being mind controlled and SAVES THE DAY thanks to a hitherto unmentioned and presumably immediately forgotten superpower. 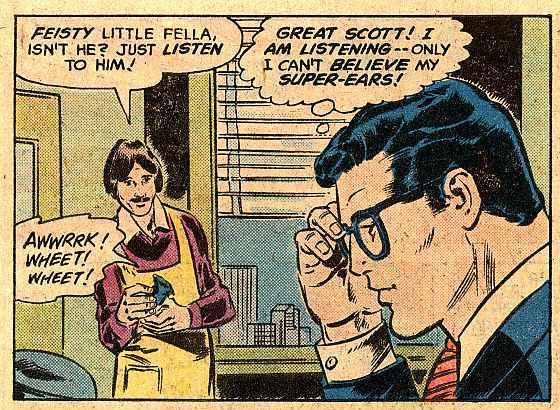 Oh, that’s right, Superman has super-hearing. Forgot that one when I was going through the list above. Forgot microscopic vision, too, and super-breath. I’m sure I’ll think of some more in a bit. Still, super-hearing by itself isn’t the key to this particular riddle. So there you have it, on the printed page, mentioned here and presumably never ever EVER again.